Happy Monday to you! 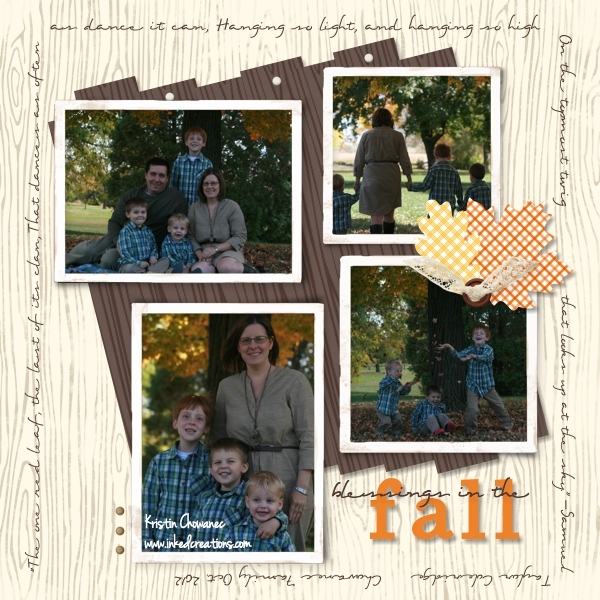 I am back with a fun fall page to share with you today. I have talked about where I get my inspiration before, and I admit it comes from many different places. This page came about from a Scrap Map that was posted to mydigitalstudio.net. I also tried to use the colors from the family pictures we took a week ago. Did you know that they are having weekly contests on the My Digital Studio page through the end of the year?! Just by playing along you could win a free download! The challenges have been different every week so far and it’s been a lot of fun seeing what everyone comes up with and how they interpret each challenge differently. So go check it out and enter your work into this week’s challenge!